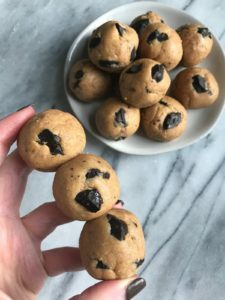 These peanut butter cookie dough balls are the best little healthy snack! Made with simple ingredients and come together in only a few minutes. You’re going to love this simple recipe for peanut butter cookie dough balls. They come together in minutes, can be taken on the go as a healthy snack, and are perfect for when your sweet tooth is calling! I’ve made them several times for nighttime snacking and am always patting my old self on the back for having healthy desserts prepared in the freezer. I recently made a batch for a girl’s night I was having because I knew that all of my friends would love them as well. They literally were gone within minutes! I swear it’s that addicting combo of peanut butter and chocolate. I also think that the fact that they basically taste like a peanut butter cookie cookie dough helps with their like-ability. These little guys are great with a little sea salt sprinkled on top, crumbled over top of ice cream, or even on their own. If you make these, be sure to tag me on Instagram! In a food processor, blend cashews until very fine but not long enough that they start to turn into nut butter. Add in peanut butter, maple syrup, almond flour, and vanilla. Blend until ball forms, usually around 2-3 minutes. Stir in chocolate with spoon. Roll into balls and store in fridge or freezer.